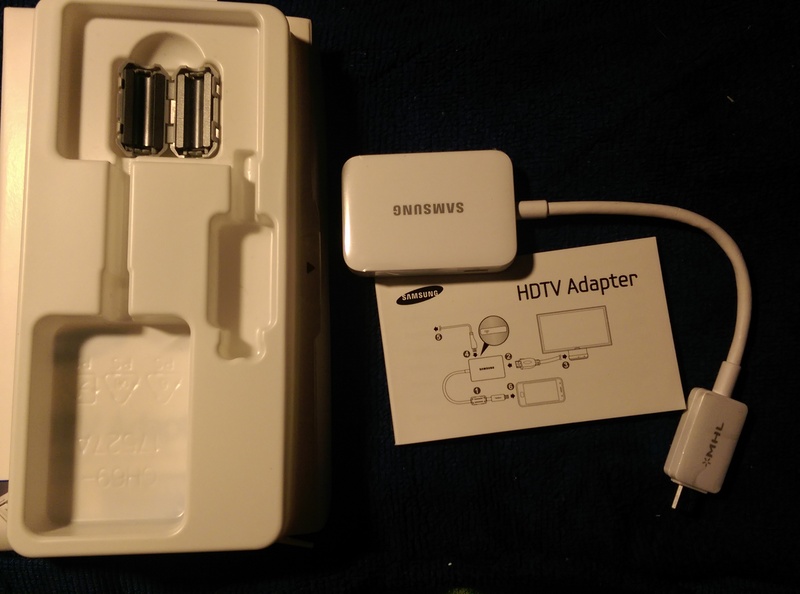 So I received the Samsung Galaxy S5 / Note 3 MHL 2.0 HDTV HDMI Adapter to review and I must say I’m completely satisfied. As you can see from the photo to the right the adapter comes with a small booklet which has explanations in several languages plus a ferrite core. This Ferrite wraps around the Adapter’s cable and it’s for reducing electro-magnetic interference from connected devices. 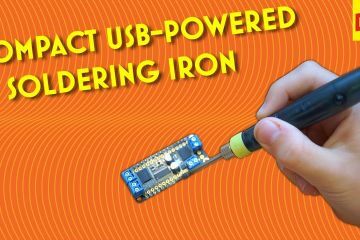 Maybe I was lucky but I never experienced any “interference” and didn’t need to use the ferrite core. However, it’s nice to have just in case. The hook up is quick and easy…and it JUST works. no fuss, no muss. 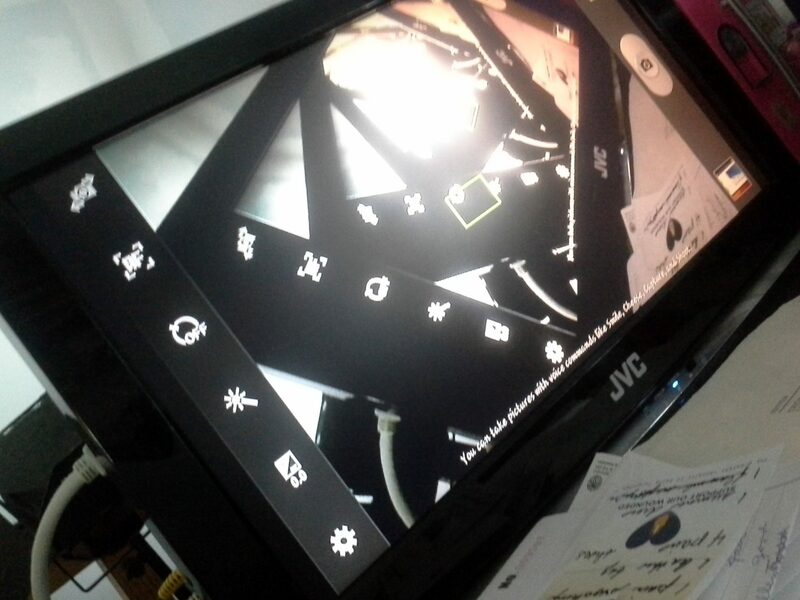 My HDTV can accept two HDMI cables. One is already coming in from my cable box, of course. The other HDMI cable can be attached to anything else including laptops and my Blu-Ray DVD player. SO I took this cable and inserted it into the big end of the Adapter. The other end of the HDMI cable went into my TV IN. Then I take the Samsung Power cable and plug that into the side of the Adapter. The small end of the Adapter goes into the phone/tablet. The booklet has a very easy to understand drawing of what goes where…you just can’t get lost. That’s it! On my system as soon as I plug in the phone the TV automatically switches to HDMI2. Whatever is on your phone immediately shows up on the TV. Like magic! All worked brilliantly. And I played several movies – the entire movie! No glitches, no weirdness. Just perfect. 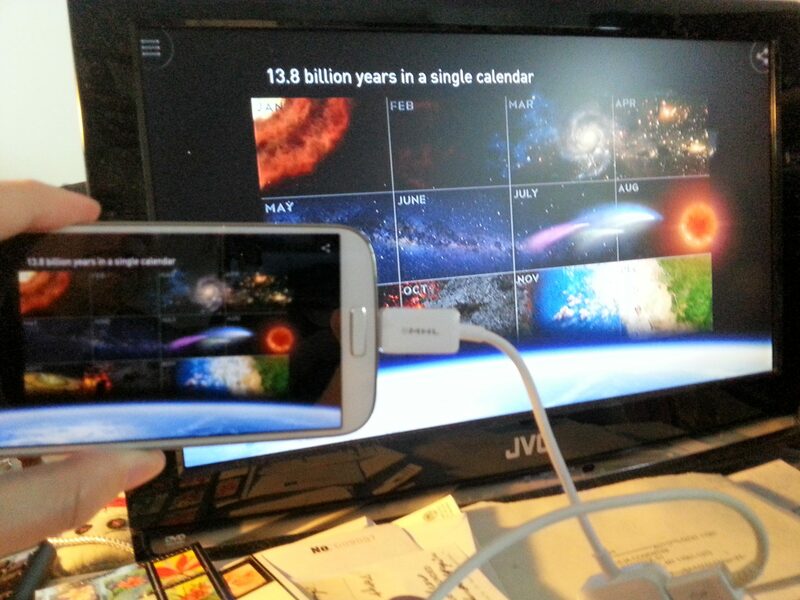 This is the Cosmos App viewed from both the phone and my TV. This is me looking through my photos…..a great way to display family pictures to the family without having everyone crowd around your phone. Boy, is THAT obnoxious! And this Adapter makes it much easier for showing grandmother’s pictures of their grandchildren. And this is me getting all Artistic….I turned on the phone camera and pointed it at the TV and created a sort of Citizen Kane effect…sort of. 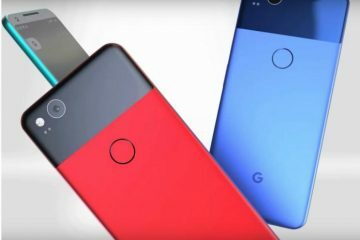 It a great device and seems to work with many Samsung devices. I’ve read that the Note 3 has a bigger charging plug so you can’t directly plug in this Adapter to that phone. You’ll need another plug. 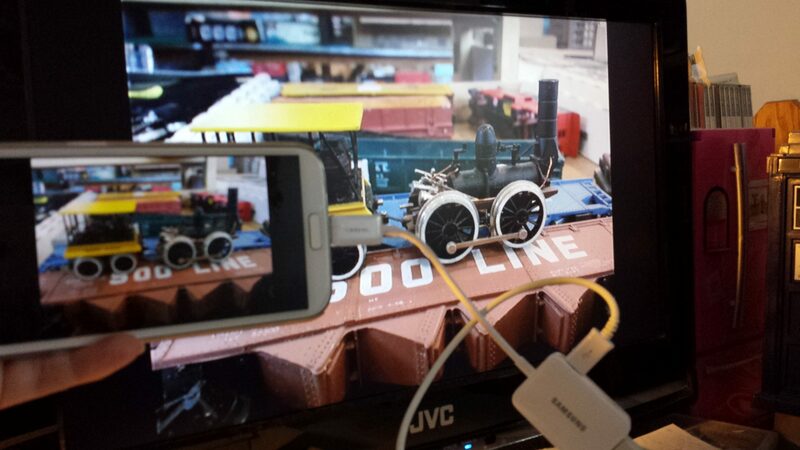 But for many Samsung phones and tablets this works wonderfully….you KNOW you want it!